Former boy-bander, Lance Bass posted an not-so appetizing picture of his chocolate cupcakes from Whole Foods. "Should my 2 day old Whole Foods cupcakes have this funny, furry, white stuff growing on it!?" he wrote on Twitter. 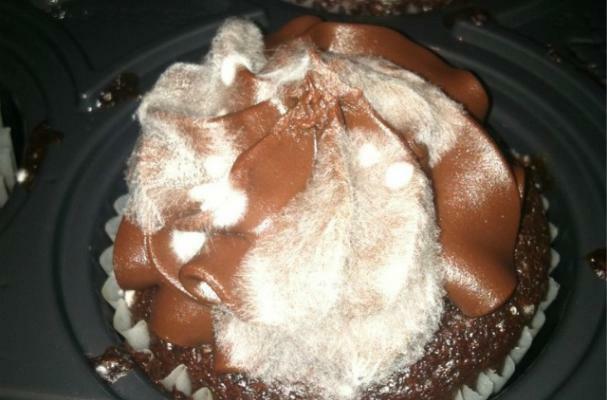 No Lance, I certainly do not think that white fur should be growing on your cupcakes. Whether Lance forgot to check the expiry date or Whole Foods needs to find a new cupcake recipe, those chocolate treats do not look good enough to eat. Actually, if they're freshly made, no preservatives (like you'd make at home, which I would expect from Whole Foods) and he didn't refrigerate them... it is possible they'd get fuzzy in two days. It should take a couple more, but two isn't unreasonable if they weren't refrigerated. If they WERE refrigerated, well, then Whole Foods fail. Maybe he bought cupcakes that are preservative free and didn't keep them in the fridge/freezer like he's supposed to. Whole Foods often keeps their baked goods in the freezer case because they need to be refrigerated due to lack of nasty preservatives. Either way, no cupcake would last two days around here without getting eaten. That makes perfect sense! He probably didn't realize that the cupcakes need to be refrigerated, especially if he was planning on keeping them around for a couple of days. Lala, I completely agree! No baked goods would last in my house that long without getting eaten up, so I never have to worry about cupcakes going bad. This isn't news worthy. Unrefrigerated food grows mold. No need to point the finger at Whole Foods. Throw it out Lance. Yes, I agree with the previous comments. They are most likely preservative free and needed to be refrigerated. I bought lots of baked goods at Whole Foods and never had a problem.....mainly, b/c they were eaten within a day....but they were also refrigerated. Unlike mass produced white bread which lasts for months because of their preservatives.....Lance could have done a science project here. What kind of a man tweets about eating fancy cupcakes??? Hmmm...Actually, this cupcake looks nothing like the cupcakes that I've seen or bought at Whole Foods. Their cupcakes are huge...and they put a mountain of frosting on them. I wonder if he's mistaken about where he purchased them and Whole Foods is getting a bum rap. Just sayin'. In any case, Lance, duh, baked goods without preservatives belong in the fridge if you're not going to eat them the same day.